LeBron James of the Cleveland Cavaliers looks to pass against the Los Angeles Lakers during a game at the Staples Center in Los Angeles Jan. 15, 2014. It’s hard to have any conversation about LeBron James’ greatness as a player without having it degenerate into a Yahoo message-board fight with words like “clutch,” “rings” and “quitter” being thrown around like confetti at a nonexistent Cleveland championship parade. But as a longtime LeBron watcher—who moved to Cleveland during LeBron’s rookie year, supported “the Decision” and watched from empty Atlanta sports bars this week as “the King of Northeast Ohio” burned through the Hawks like a khal on a mission—it’s time to put the question of his greatness to rest. Heading into his fifth NBA finals in a row, does LeBron James have a chance to be the greatest NBA player of all time? The answer is 100 percent yes. LeBron remains a polarizing figure, even among sports fans, from the outside observers to the disingenuous Clevelanders who dust off their old burned jerseys. So when his greatness is discussed, the answers are more emotional than fact- or history-based. Statistically, he’s one of the top 10 players of all time; that’s not debatable. Since LeBron will probably play until he’s 40, the question is really about whether he has the chance to be the greatest, not whether he is now. What we’re looking at are those other things that would make LeBron the greatest: 1) Is he better than the best? 2) Did he change the game? 3) Did his impact extend beyond the court? Just as Jordan eventually replaced Russell as the greatest NBA player in the minds of most fans, sportswriters and analysts, time and distance will do the same thing for LeBron. Era-to-era greatness is always a slippery thing. There’s some 9-year-old wearing a Cavaliers jersey right now who’ll be anchoring ABC, Disney or ESPN during a 3-D holographic webcast in 2040 and discussing how 5,000 simulations with clone players prove that LeBron is the best that ever played the game. The GOAT is decided by who’s telling the story, and in the future, LeBron-era kids will be saying it’s him. To be considered one of the greatest NBA players of all time, you have to bend the NBA itself to your will. The game didn’t change you; you changed the game. After LeBron decided to leave the poorly coached and managed Cleveland Cavaliers for the Miami Heat in 2010, owners panicked. They were so afraid of marquee players demonstrating agency and managing their own careers that they forced a lockout and fought like hell to restructure the power dynamics of the league. When you scare the whole league by deciding where you want to play, and set up a legacy of player independence in a way that no one else in the history of the league has, that makes you the greatest. Many NBA players have had an impact off of the court, in politics, social justice, marketing and their own self-promotion. In this area, LeBron has also already won. One season of Survivor’s Remorse has already been better than anything from The Magic Hour or that gawd-awful Space Jam. The only thing that comes close is Kareem’s bit in the cult comedy Airplane. Global impact? LeBron has already won two gold medals and conquered China. But LeBron has not only been a multimedia off-court star in a way that no other player has; he’s also been vocal about political and cultural issues in a way that few other great NBA players have done during their playing days. From Trayvon Martin to Donald Sterling to his overt support for President Obama, LeBron the player has been more active than many NBA greats have been even after their careers were over. 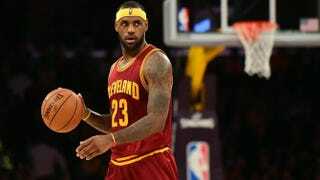 Is LeBron James the best player in NBA history right now? Of course not—he’s going to play another eight years or so. But will he be the greatest player by the end of his career? Yes. He’ll have the stats, the records, probably another ring (which counts double from championship-starved Cleveland) and, more important, a 20-year record of dominating every aspect of the sport, from labor to finances to public image and global success—all while never having a Hall of Fame coach and only briefly having one Hall of Fame teammate (Dwyane Wade) his entire career. You can scream on message boards all you want, but King James’ GOAT-ness is inevitable. We may just have to wait until 2040 to see it.